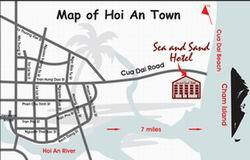 The area has become extremely popular all over the world for the cultural and environmental values Hoi An is situated 820 km from Hanoi and 935 km from Ho Chi Minh City. It takes about an hour by airplane and 17 hours by Vietnam Express Train to and from above two destinations. All rates are quoted in US dollars and exclusive of 5% service charge and 10% VAT (Subject to change without notice). Visa, MasterCard, American Express, JCB, Diners Club and Traveler’s Check are accepted. Reservation will be held until 18:00 on the arrival day unless guaranteed. However, during the busiest time as Christmas, New Year’s Day, Traditional Tet and Public Holidays, bookings must be reconfirmed at least 1 week prior to the day of arrival. Laundry service is available from 7:00 AM to 9:00 PM.Please consult with the Laundry Price List in room.Same day service: All garments collected before 10:00 AM will be returned the same day.Express service: All garments collected after 10:00 AM but before 2:00 PM. will be returned on the same day at a surcharge of 50%. Daily open from 6:00 Am to 11:00 Pm Capacity: 100 seats Serving: Asia Food - Western Food A la carte Menu - Buffet - Set Menu, especial: Hoi An specialties foods - Hoi An Sea foods Relax and enjoy your favorite drinks and watch the life go by. Wide selection of Cocktails, Wines and Beers are available. Take advantage of the longest Happy Hour in low case. Bar, snookera are open daily from 08:00 AM to 11:00 PM. - Swimming pool is daily open from 6:00 AM to 10:00 PM. Enjoying nature is one of the meaningful and indispensable activity in your holidays. A few hours on a boat travelling on Thu Bon River in a very quiet atmosphere, you will be offered a relaxing and unforgettable time for the whole stay on Thu Bon river.